Following a "recommended" diabetic diet is difficult for many newly-diagnosed diabetics because so many new lifestyle changes must be learned, and old food habits must be broken. Patients are told to control their blood sugars, and given a standard American Diabetes Association diet plan. 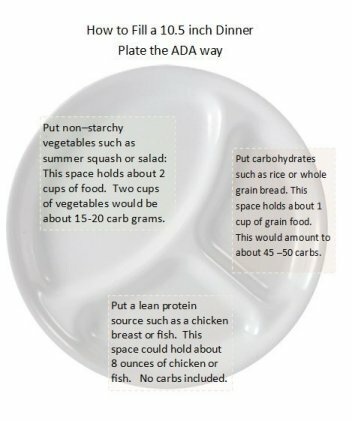 The problem with the ADA plan is that it recommends a carbohydrate intake level that makes blood sugar control very difficult. For many newbie diabetics, thus begins a constant struggle to keep blood sugars even. Many diabetics who follow the ADA recommendations complain of being on a "blood sugar roller coaster" most of the time. A friend of mine was recently diagnosed with diabetes. His physician, as is the case with many newly diagnosed diabetics, advised him to follow the standard American Diabetes Association diet. 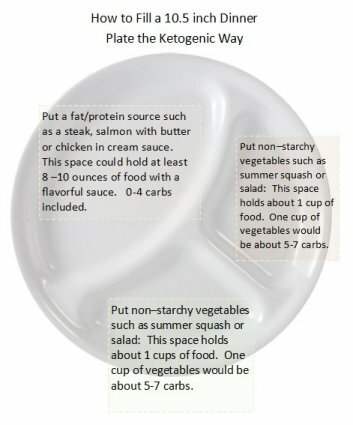 This diet advises that diabetics follow a “Healthy Plate” strategy, which translates into filling the plate as in the picture. The total average carbohydrate intake for this “Healthy Plate” meal ranges from a low of 60 to a high of 70 carbs for one meal. Over a day of three meals, this would add up to 120 –210 carbohydrates. Studies put the blood sugar range which results from eating this level of carbohydrate at an average of about 200 mg/dl. This is about 30 points over the range that the ADA organization recommends for post meal blood sugars. That’s right, the ADA diabetic diet suggests an amount of carbohydrate that drives up blood sugar beyond recommended levels. And as would be expected, on this diet, my friend’s blood sugar levels each morning were in the 140-150 range, which is way above the cut off of 126 for diabetes. On a ketogenic diabetic diet, the protein sources can be higher in fat, so his choices expanded from dry chicken or fish to steaks, salmon with butter, chicken in a cream sauce, or sausages. The rest of the plate gets filled with non-starchy vegetables such as broccoli or squash sautéed in butter. Notice we've left out the "whole grain" carb choices. The total average carbohydrate intake for this “Ketogenic Plate” meal ranges from a low of 10 to a high of 14 carbs for one meal. Over a day of three meals, this would add up to 30–46 carbohydrates. Studies put the blood sugar range which results from eating this level of carbohydrate at an average of about 125 mg/dl post meal, well within the post meal levels recommended by the ADA. Sure enough, when my friend began filling his plate in the ketogenic way, he was able to bring down his blood sugars to the 110-115 range, and on some days when he adds exercise, his blood sugars are in the normal range. Plus, he says these meals are way more satisfying, and he is less hungry overall. This is because protein and fat intake is higher, and carb levels are low enough to avoid an insulin spike and resulting crash in blood sugar. The numbers of people diagnosed with diabetes in the US are on the rise. I would bet that for any American reading this page, you know at least one person who either has diabetes or a relative with diabetes. And the advice provided by the ADA and this webpage are different. How do you know which advice to take? Knowing how to evaluate diet advice starts with your own experience. Evalute this ketogenic diet plan by trying it, tracking your progress, and then determine if it’s right for you. As my friend found above, your body will tell you if you've chosen the correct diabetic diet. UPDATE January 2019: Just found out that Tracey Brown, the new CEO of the American Diabetes Association is a type 2 diabetic and is currently reading low-carb expert Dr. Bernstein's book Diabetes Solution. I'm encouraged that progress is underway!